Abstract: As with other Glacialtech heatsinks, the Igloo 4300 uses fairly thin fins of varying height to dissipate the heat. This is a two part socket 478 heatsink which tries very hard to reinvent the retention mechanism wheel from scratch. The Glacialtech Igloo 4300 succeeds for the most part. Instead of using two clips, or fragile plastic components, the heatsink uses a one-piece articulated steel mechanism to latch on to any standard socket 478 heatsink retention mechanism (HSRM). I seem to recall Glacialtech originally promoted this mechanism as the only one you could engage with "just one hand." That is true, with just one hand we were able to install this sucker on the heatsink retention mechanism (but are you really going to buy a heatsink because of this? I think not). 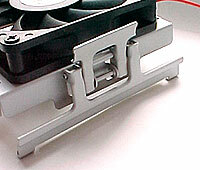 In any case, it's the cooling performance we are interested in, and not the clip. 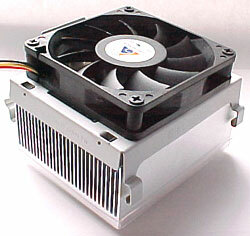 As with other Glacialtech heatsinks, the Igloo 4300 uses fairly thin fins of varying height to dissipate the heat from a toasty Pentium 4 processor. Fan Specs: 42CFM, 5000RPM, 12V, 0.34A. The outer surfaces of the heatsink have been sand blasted for a rougher texture, but what you might not expect is that the base has been milled flat! For a heatsink straddling the OEM world, it was a little surprising to find such a nice finish down below. Really though, we are looking at a remarkably simple design which uses a remarkably loud 11-bladed fan for extra cooling measure. True enough, this isn't a highly efficient heatsink using the quietest fan possible for low-noise sensitivity, but rather a standard design using a typical fan with a bit of a whine.